Reserve a 75-minute passage on the Vinalhaven Ferry, www.maine.gov/mdot/ferry/vinalhaven/, and land at W. Main Street on the island of Vinalhaven. (Query ferry staff for special motorcycle queue and boarding consideration.) Take W. Main St. to E. Main St., the center of town. Circle the island counter-clockwise by continuing on E. Main St., Pequot Rd., Round the Island Rd., and N. Haven Rd. to return to E. Main St. completing the loop. 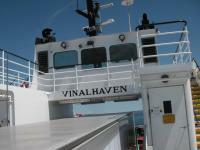 Approaching Vinalhaven, the ferry cruises among beautiful, smaller islands jutting up from the ocean's floor. Also seen from the water are three wind turbines rising above Vinalhaven's treetops, that once ashore, may be observed closely from N. Haven Rd. Riding the paved loop, many houses are seen with stacked lobster pots out front and boats on the lawn. The island's dirt roads often end at scenic tidal inlets offering superb views of larger bodies of water in the distance. Evidence of this being a "lobstaah" fishermen's environment is apparent everywhere--in the harbor, in town, and throughout the island. Vinalhaven has 49-miles of paved roads which includes the loop described. Overall, dirt roads are in fair condition. The island is hilly and roads are twisty. In town consider: the Tidewater Inn for over-night lodging, the Harbor Gawker for good food at a reasonable price, the Surfside for an inexpensive breakfast with local working men-- opens 3:30 AM, and the Sand Bar where locals frequent for beer and bar food. There are no amenities once leaving town and it's a good idea to cap-off fuel before boarding the ferry at Rockland. The Transportation Museum, www.ohtm.org/, in nearby Owl's Head on the mainland is a "must do" activity for all ages. Also consider the Sail Power & Steam Museum, www.sailpowersteammuseum.org, in Rockland for a "simulated steam" demonstration using actual steam equipment. on July 24, 2016 1 out of 2 members found this review useful. To avoid higher seasonal prices travel before Memorial Day or after September.